. 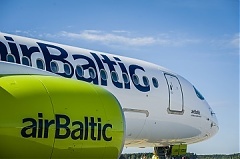 The Latvian airline airBaltic has mandated global investment bank Greenhill to evaluate financing options for the future development of the airline, which includes the search for a potential new investor, airBaltic representative informed BC. Espoo Convention countries concluded on Thursday that the construction site for the Astravyets nuclear power plant near the Lithuanian border was chosen in violation of the Espoo Convention, Lithuanian Energy Minister Zygimantas Vaiciunas, who led the Lithuanian delegation in Geneva, told LETA/BNS. The Swedish automobile manufacturer Volvo is to recall altogether 167,000 vehicles worldwide, while the recall concerns a total of 115 cars in Estonia, informed LETA/BNS.